January 12, 2017, 1:55 PM · There comes a time in every professional violinist’s life when they look at their career and ask: Is this all I can do? Playing symphonies, solo recitals, and concertos is a heavy work load. But some days the question comes up: Am I really making a difference in people’s lives? Playing the violin and playing music can say things in ways people can’t. The texture and sonority of the violin can lure any person into listening with full attention. It has that power. But that question has increased in volume for me: Am I really making a difference in people’s lives? Is this violin speaking enough to people? To truly keep the magic of music special is to share it. And not just share it with people who want it, but share it with people who may not have access to the therapeutic benefits of hearing it live. Last year I entered a prison, to see if my question could be answered. 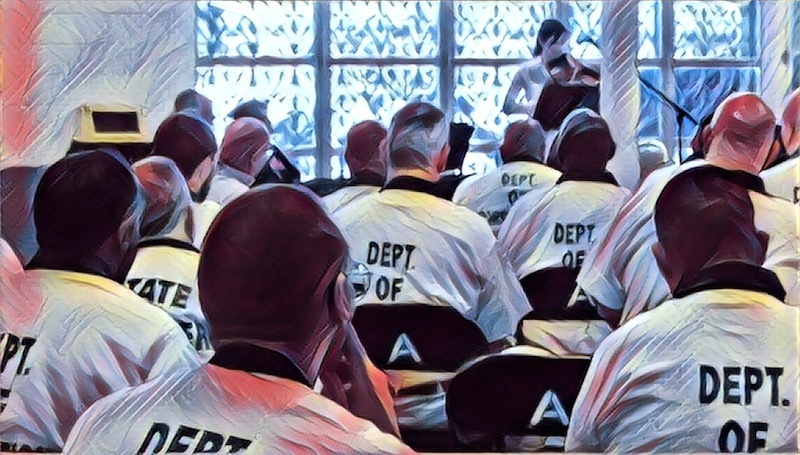 Accompanied by several symphony patrons, some of whom who also served as prison mentors, I brought a challenging but evocative solo violin recital to 75 prisoners. For the first 30 minutes of this prison recital I played solo violin works, including Bach and then a few living composers’ works. After each movement, I encouraged the prisoners to share their thoughts. Then I was joined by a piano collaborator to close the performance with Jennifer Higdon’s String Poetic. Everyone asks if I was afraid to play for prisoners, but I had been well prepared for what to expect. The prison mentors who escorted me into the prison opened a dialogue for me with prison leadership weeks in advance. They also briefed me on what to expect and supported me in an environment in which they were already familiar. I fully trusted in them. The scary part was playing new music and not knowing how it would be received. Some of the newer music asks a lot of the violinist, but it asks a lot of the audience as well. Everyone assumed Bach would be the favorite; of course, it would be well-received. But to my surprise and relief, String Poetic and the other new works were received with even greater enthusiasm! When I repeated my invitation for prisoners to share what they thought, I was excited and encouraged to find their passion for the new violin music to be so palpable. Their thoughts and responses on surveys we handed out impressed the prison mentors and me so much that we immediately planned another visit a few months later. The second performance in the prison was much like the first. Prisoners eagerly shared their impressions of the music. And again, I offered mostly new music written by living composers. And here’s where we discovered another aspect of bringing the violin into the prison: Bringing the human component was as important as just the music. Not only were prisoners able to watch the music being created and participate in sharing in a two-way conversation, but they were keenly aware and very excited that their thoughts and opinions would be shared with the performers who were creating the music they heard. Their opinions mattered. The violin started the conversations, and the prisoners continued the conversations. The byproduct for me as a professional musician has been a new dimension of sharing what I love. Playing violin for my whole life has been rewarding on its own, but sharing with people who found a reflective and therapeutic need for the art has enhanced that art for me as well. To read more about the journey of bringing music to the prison, follow this link. If They Care, Shouldn't We Listen? January 13, 2017 at 05:56 PM · My church orchestra in Boston made a commitment to play for the homeless shelter on several occasions. Several of us in the group took the church van to the shelter, set up our stands, gathered our music and waited for people to come into the room. As people curiously gathered inside, one man shyly asked me: "Is this an orchestra? With real violins and everything?" He was so surprised, and so glad we were there in such a lowly place. He sat down in the front. We brought new socks for the men new clothes and provided funds for the dinner that night, but the live music was the most surprised and warmly felt event of the evening. It warmed my heart as well. January 14, 2017 at 12:17 AM · As people who have the opportunity and ability to play music, we often forget how privileged we are. Music is magic, whether you are a seasoned and accomplished professional performing in a hall for hundreds or an adult beginner playing a diligently-practiced piece for an elderly friend at home. We connect when we share our music. January 14, 2017 at 05:12 PM · Amen, and thank you. The reminder of what we have to offer is much appreciated. Wonderful article. I'm quoting you on the Yahoo musicthoughts group too, by the way.